Bear in mind aerodynamics is very complicated. For example, it depends on the angle of the wind. The results of aero equipment may depend on whether you are riding into headwind or crosswind. Wind tunnel tests may not always replicate conditions you experience in the real world. More aerodynamic isn’t necessarily faster. e.g. lowering your handlebars could make you more aero, but it maybe harder to put out power in that position. There’s no harm in looking at the top riders who will have spent loads of time researching aerodynamics and seeing what you can adapt for your use. Aerodynamics is not just about how the wind hits the body, but also how it leaves. I’ve seen positions which don’t look obviously aerodynamic, but power figures suggest they are. To get the most from a timetrial bike, you also need to be comfortable riding in that position. Remember if you want to go faster, it’s not just about aerodynamics. Some road riders who rarely train on a TT bike notice it’s harder to get out the power when they switch to TT bike. Next generation TT bikes. Every year, bike manufacturers bring out a new time trial bike with claims to be ‘at least 10% quicker’. . . There is no doubt that the latest generation of time trial bikes have made improvements in hiding cables, brakes and the like from the air flow; whether this is as much advantage as manufacturers claim, I doubt, but it does seem average speeds are rising. Anything sticking out, interrupts the airflow, removing that will improve aerodynamics. Bear in mind, although the bike is the most obvious place to start (and spend money on), it only accounts for around 10% of overall aero drag. By far the biggest drag is you – your body! Dropping your handlebars just a few cm. Dropping your handlebars a few cm, can make a big difference to improving aerodynamics because your frontal position incurs the biggest aerodynamic drag. However beware that dropping your position will eventually compromise your power output – through making breathing more difficult. Lowering stem and handlebars requires experimentation and testing. The best is to use a power meter and controlled testing to see different speeds from different position. When I went in a windtunnel, the first thing they did was to raise the stem a few cms. They found raising tribars didn’t increase aerodrag, and most people can get more power in a higher position. This is why aerodynamics are complicated. I would never have thought to raise my handlebar position, but that is how I came out of the wind tunnel. The most comfortable position unfortunately isn’t the most aero. Riding in aero tuck. Though socks could be more aero! Riding turtle means you try to keep your head lower – out of the windflow, but craning your neck to look straight ahead. This can require practise to increase the strength of your neck muscles. 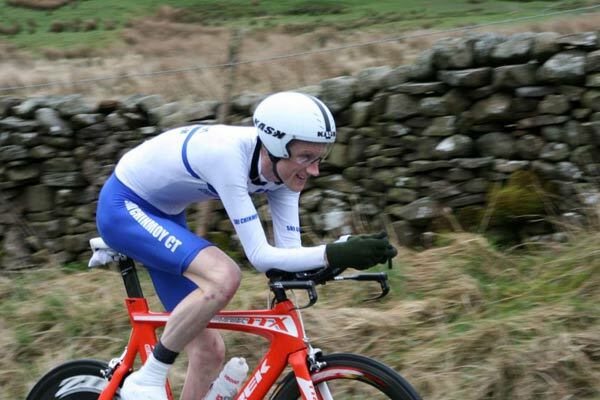 This is why it is good to train on a timetrial bike and learn to ride in a more aero position. Obviously for longer timetrials it is harder to maintain this position. In those races, you can save this position for headwind sections. Bringing your arms closer in. The reason tribars make such a big difference is that they bring your arms out of the airflow and into the centre of your chest. This is why even some cheap clip on tribars will make big difference to improving aerodynamics. Hand position. Keep hands close together on the bars. Minimise the gap between. However, if you look at pros, they often choose different hand positions. Pursuiters often have arms in line with their legs. Other riders have their arms practically touching. Shrugging the shoulders. If you can ride with your shoulders shrugged together you will notice your profile narrows. Try it in a mirror and notice how width of your shoulders can change. If you can do it, you will save a lot of aero drag. The advantage of shrugging your shoulders together is that it also helps you to look forward too. Bringing feet closer to cranks. You could change your cleat positions to bring your legs closer to your frame and cranks. When Graeme Obree designed one of his Hour Record bikes, he chose an unusually narrow bottom bracket to reduce gap between legs and frame. This was a case of thinking outside the box. It worked for him. Of course, this means you might be more likely to rub your cranks and frames. Moving cleat position can also cause knee problems. If you only do 10s and 25s, you probably don’t have to worry too much. If you do a lot of miles, I would advise choosing most comfortable position over aerodynamics. I haven’t done this, but it may work for you. I’ve seen more extreme examples of the ‘praying mantris’ position than this. Some have bars at 45 degree angles so the riders hands are up to their face. Lifting up aero bars ‘Praying mantis position’. Often lifting up the aero bars into a praying mantis position makes you more aerodynamic. When I went into the wind tunnel, I found significant gains from this praying mantis position. Note: This is not UCI legal. UCI regulations state tri bars must be horizontal. But for CTT events or triathlons you can use this. Again the benefit of this position may depend on your body type. 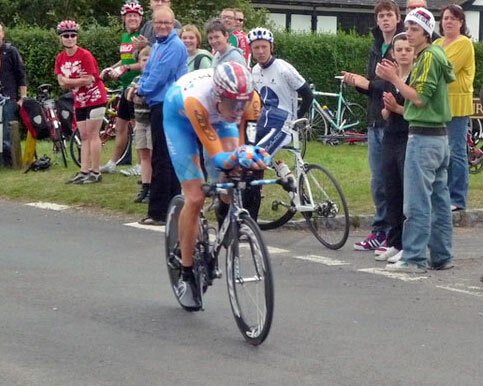 A lot of top UK amateur timetriallist don’t seem to use this extreme praying mantis. Riding Style. For time trials, try keep the upper body stable. Where possible stay in the saddle, and avoid wiggling your upper body around. In training, work on keeping this steady position. Core strength exercises, such as the plank will help. Skinsuit. 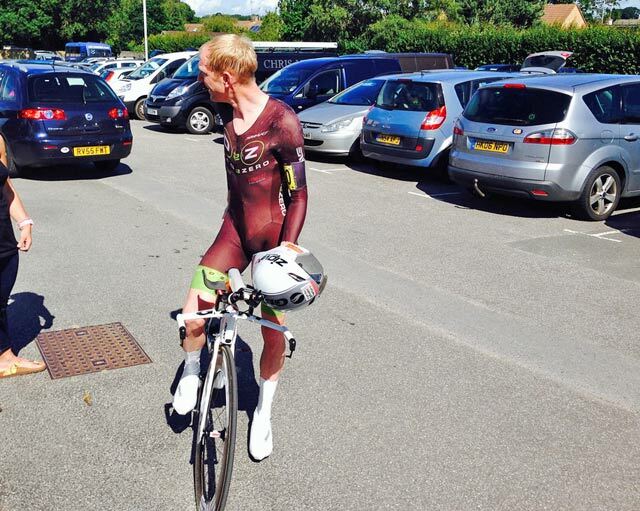 In Faster by Michael Hutchinson, he suggested that a skinsuit can make more of a difference than a time trial bike. Yet, though we’re happy to pay £5,000 for a new bike, we can be more reluctant to pay £500 for a new skinsuit. 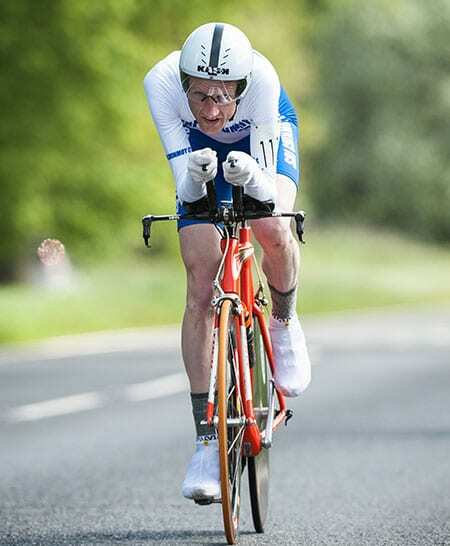 When I saw Matthew Bottrill’s Drag 2 Zero skinsuit in the national 50, I understood why the best skinsuit can make such a big difference. The difficulty many club cyclists have is that if you want to wear your club colours, you are limited by the makers of your custom kit. In my case, we use Impsport. The top of the range bodysuit isn’t bad. But, I’m a difficult shape, very long and thin. I paid extra to have custom sizes for arms, width and height. But, to be honest, Impsport didn’t do a very good job. Perhaps their computer couldn’t compute that a rider could be 6″ 3 and weigh 62kg with arms the size of matchsticks. The arms were flappy. I sent the custom skinsuit to a custom seamstress (Alex Laycock) to make the arms thinner and reduce the flapping. This only cost £50 – and was a good value aero improvement. But, still I might have to investigate a more expensive and better custom skinsuit fitting from someone other than Impsport. Kask Bambino in an early season hilly. Some non-aero looking thermal clothes to boot. Aerodynamic Helmet. Any time triallist usually ends up with a collection of aero-helmets, each one hoping will give an aero advantage. When I went to a wind tunnel, one of the first things I tested was helmets. They said helmets could make a big difference – and are relatively cheap. The problem with choosing a helmet is that they are notoriously individual and depend how you ride. In my case, the best helmet in the tunnel was a Giro advantage. But, I still later bought a Kask Bambino because it is supposed to be good in crosswinds (also it looks good and is a lot more comfortable). The Kask Bambino is also said to be good for tall riders who can ride with a flat back. But, I found a longer tail is better. If you move your head around in time trials. Try learn to keep it still so you can use generally more aerodynamic long-tailed helmets. Helmet Position. A simple tip is to make sure you position your aero helmet so tail is closer to your back. If it is sticking up in air, you will catch more aerodynamic drag. Push the helmet up your forehead so the tail gets closer to your back. This is a really easy way to improve aerodynamics and has a big impact. Helmet Visor. Fitting a visor on a helmet is generally reckoned to improve aerodynamics. It is also good to keep sun and flies out of your eyes. Nearly all new aero helmets come with a vizor. Annoyingly the most aero helmet for me was a Giro advantage which doesn’t have a vizor. I’ve tried two stick on visors, with varying degrees of success. Wear less clothes. If you wear several layers, you bulk up and get less aero. If you can ride with less layers, it’s a very cheap way to be more aero. Unfortunately, I feel the cold like anything and in early spring, I often have several layers on. But, when it’s summer I can ride with just skinsuit. 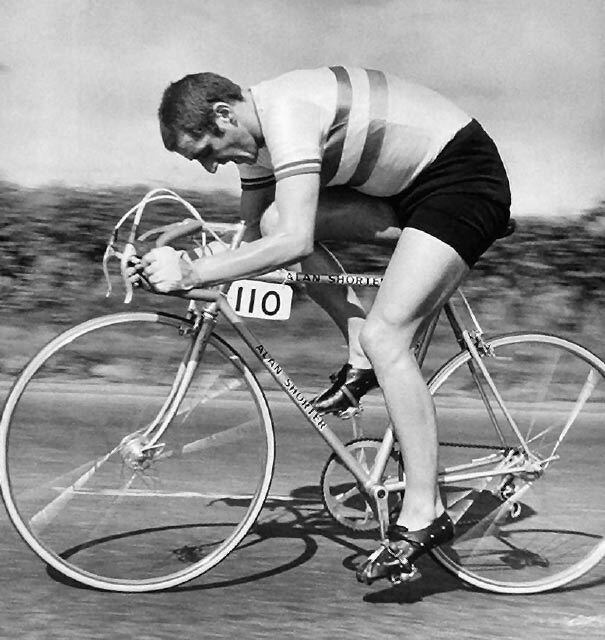 Alf Engers in full flight. Note – no socks. Shame they didn’t have integrated brake cables in those days. Single chainring – For many time trial courses, it is not necessary to have a double chainring at the front. You will not need the inner ring, unless the course is very steep in places. A single ring enables you to remove the front mech changer as well. However, if you do this be wary you don’t enable your chain to slip off. See: converting to single chainring. Taping up holes. The secret to aerodynamics is taping up any holes and making a smooth airflow stream. 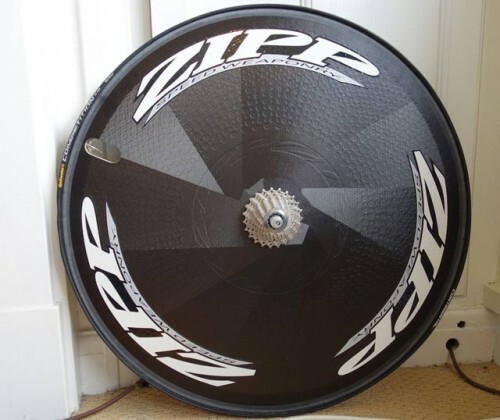 For example, if you have a disc wheel you can place some tape over the gap for blowing up the tyre. Shaving your Legs. – There’s got to be some reason for doing it! David Lloyd showing us how to cover up any unaerodynamic facial hair. Shave your legs. More seriously, a report suggested there are large aero benefits from shaving your legs. A study by Specialized found that when a rider shaved them the wind tunnel data revealed the time saved was a whopping 82 seconds over 40km, or 25 miles. Of all the 1,200 tests in wind tunnels, Specialized said this result surprised them the most. Aero Bottle. For £15, you can get a Bontrager or Specialised Aero Bottle. People have claimed it saves 4 watts in a 10 mile time trial. It reduces frontal drag and so makes sense. But, I’ve bought two and both ‘fell out’ because the aero bottle cage is very feeble. So be wary – especially if relying on bottle during long race. I wish someone would develop an aero bottle which doesn’t actually jump out when you go over bumpy courses. Also, I noticed that in time trials, Team Sky were not using aero bottles. I don’t know if this is a UCI regulation. Aero Gloves. Your hands are one of the first things that ‘hits the wind’ so to speak. Aero gloves can smooth this airflow at the front of your riding position. Try the Pearl Izumi P.R.O. Aero Glove. It removes the velcro strap and reduces another barrier to the wind. I have two pairs of Mavic aero gloves because they are also quite stylish. I always joke that a real cyclist will have a bike worth more than his car. But, a real tester will have wheels which cost more than his car. Note: I use a disc even in strong winds and also on just about any hilly time trial course. I always feel the aero benefit outweighs the weight. If I had a heavy disc, e.g. 1,400g I might not use it on very hilly TT courses. Generally deeper section front wheels are faster. But, you will notice a deterioration in handling quality. I’m quite light and struggle to ride my Zipp 808 when there is any significant wind. If it’s windy I’ll use my Zipp 404 – slower but much better handling. Remember it’s not just about aerodynamics, if you get blown all over the road, you won’t be faster, even if more aero. 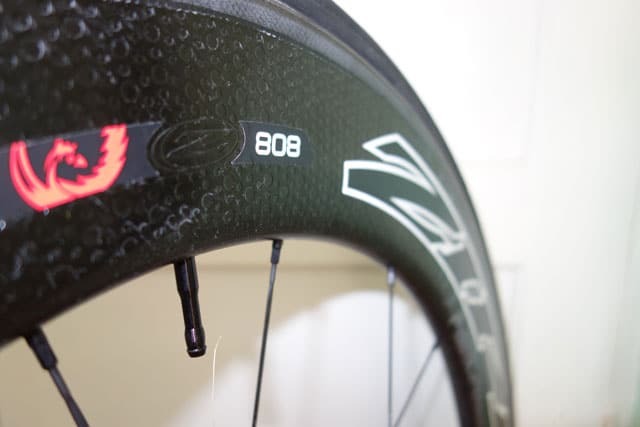 When I bought the Zipp 808, Zipp recommended a 21″ tub as being best choice for this wheel. But, everywhere else I look, people claim 23″ or 25′ is better for this wider rim. Others say that in crosswinds you’re better off with fatter 25″, in headwinds 23′ – This is a problem of aerodynamics, studies and reports often contradict each other. 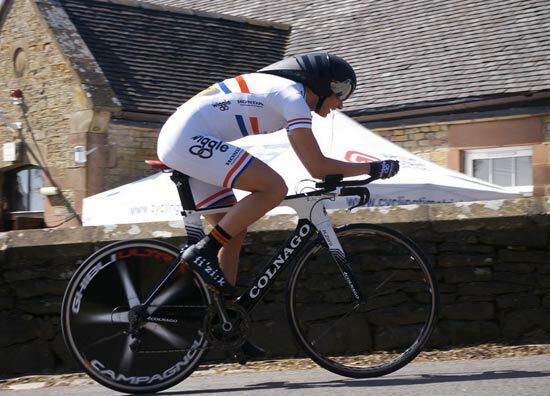 Timetrialling by Adam Topham – good for tips on aero position. I suppose you could create your own personal version of the cycling tips cost per second saved over a 40km time trial to compare with the original to see where the advantages can be found. I fact if we all pooled data it might lead to competitors getting closer to the time of Matt Bottrill and Michael Hutchinson. I really want to have a go at a time trial but I need to get my head around it! Not done my first one yet because I’ve been too scared, but I have booked in to try one at the Yorkshire Cycling Festival next month. I just need to get my confidence built up. It’s the usual thing of when you’ve not tried something before you think you’ll be absolutely pants and show yourself up! Good luck. The good thing about a time trial is that you can just go at your pace, and whatever you do, you have a target to try and beat next time. Just go for it. 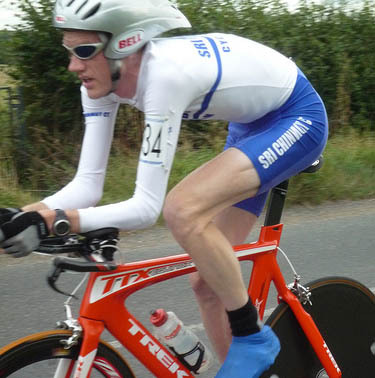 I’m a reasonably fast rider but had been putting off doing TT’s too. The first one was daunting but after that it’s just about you and the bike. Enjoy it. All this is fine, but it is totally irrelevant if you have a beer belly and slow legs. Training and body condition make a fast cyclist the fine tuning comes after. You can’t make a race horse from a cart horse as the saying goes. 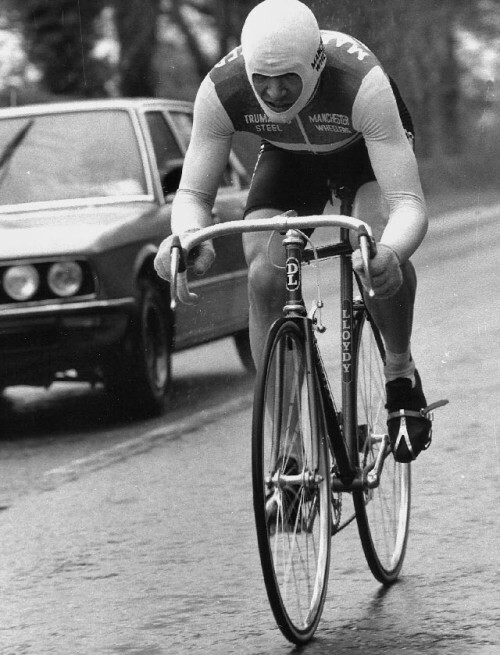 I was recording 21 minute 10 mile TT when I was a junior in 1980 on a steel Reynolds 537 frame 32 spoke alloy wheels, baggy wool clothes and toe clips etc and leather crash hat. Half the riders today think you can buy speed well dream on.